This looked like a good idea so I bought it. I have arthritis in my hands and this really helped me with my fall planting. I also use it to putting a pole in the ground as well as larger bushes. It is a fantastic tool. I do a lot of planting so I got this to help out. 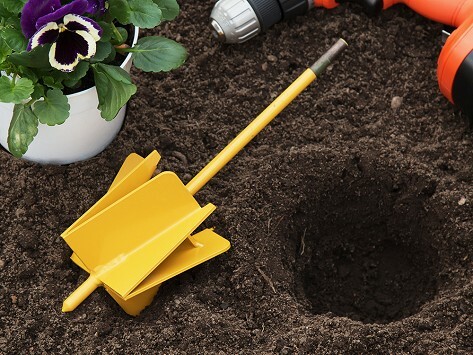 It creates perfect holes to plant items in a 6" pot. I like it so well, I plan to buy the 4" drill bit soon. I bought this with the extension so I don't have to bend over out in the yard, but when removed you can plant 6" pots all day. This is very well made of steel with a powder coat to protect it from rusting. It does NOT throw dirt all over the place like another brand I tried. You can't go wrong with this product. Absolutely love it! Bought it for my husband to plant flower bulbs, by he had surgery & couldn't get down to plant. He attached it to the drill for me & in less than a minute I had about 8-10 holes dug. It easily cut through some small roots. I had my 75 flower bulbs planted in no time! Bought the smaller bit knowing a hole could be made larger with it. It does sling dirt when first drilling but the time saver is well worth it. 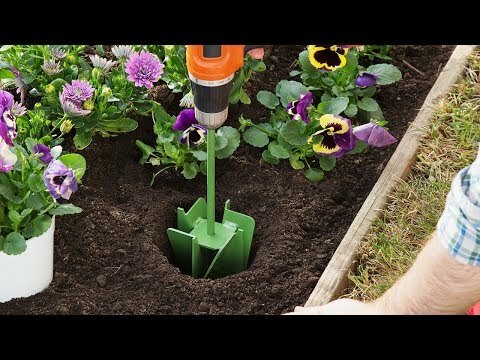 This is a fantastic way to get a lot of bulbs in the ground with very little effort. It's quick and makes a previously tedious job easy. I did 150 bulbs in under an hour. It's on my holiday wish list this year! Certainly makes planting quick and easy. One of the few gardening tools that actually works as described. I ordered the Maxbit hoping it would help me with my gardening. Best purchase ever! With hands that are becoming arthritic, this device is a time and tpainfree saver. Thank you! Enjoyed using my Maxbit. It made my planting go so much smoother. Well made.